It’s a marvel that Fleetwood Mac were even on stage to perform last night. It is a band that has gone through a great deal of emotional turmoil, and more recently, physical stress, as bassist John McVie was diagnosed with cancer roughly one year ago. Two other members have died within the last three years, one to suicide and the other to a haemorrhage. They have four members who have gone through two failed relationships (one divorce) and have had several key members come and go. They even bared their emotional and romantic troubles out on their 1977 20-time platinum album “Rumours.” And when the band finally gained some stability during their 1990s reunion, singer and keyboard player Christine McVie left due to a fear of flying on tour. And so it was immensely gratifying to see her make a triumphant return to the group at Nationwide Arena Sunday night — both for the audience, and clearly for the band. The band was firing on all cylinders with the original three-part harmonies that McVie brought back to their sound, Stevie Nicks sounding as gorgeous as ever, and lead guitarist and songwriter Lindsey Buckingham transcending with his stunning guitar solos. The group opened up with “The Chain,” one of their most poignant and visceral songs off of “Rumours,” so they got into the soul-bearing business right away. And Buckingham immediately reminded me of why I consider him to be one of my favorite guitar players, a guitarist who, as George Harrison might put it, can make his guitar weep. His unusual finger picking, remarkable songwriting abilities, and brilliant lyrical guitar lines proved to be a constant highlight throughout the night. 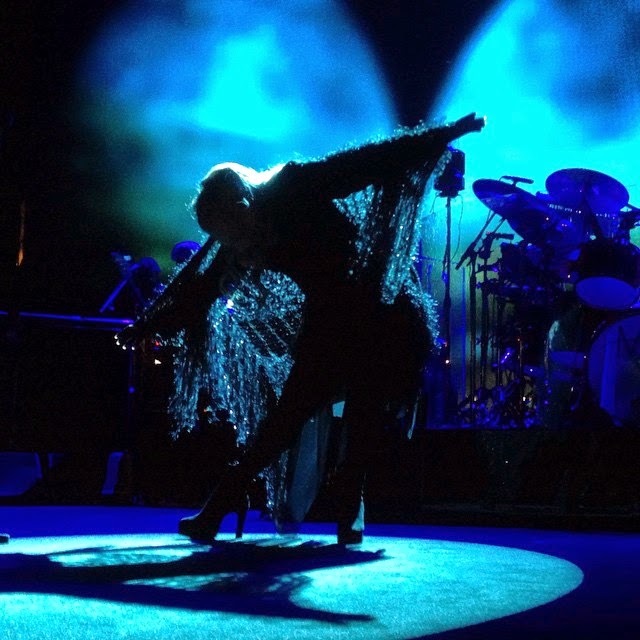 RHIANNON - Stevie is wearing a cape that was hand made by Celeste Meyeres which Stevie chose as the winner in the Talent House "Design a show-stopping shawl for Stevie Nicks" Contest. You can read more about Celeste here and see Stevie's note to Celeste at the Talent House website. Stevie has added a new long black cape for Rhiannon that looks like it has some sparkling beads and some kind of long, very thick feathered edges to it. She was wearing a short chiffon scarf just around her neck and arms. This new cape looks much better for the song. She needs to add some more changes to her outfits on this tour. I saw the Philly show and it was all too much of the same old black and without many changes, glad to see this new beautiful cape. Can we get a still shot or two of Stevie wearing the shawl? I'd like to see how it looks on her . Thanks!